It seems to be the last warm weather for a BBQ, before the cold days come, so why don't use it? 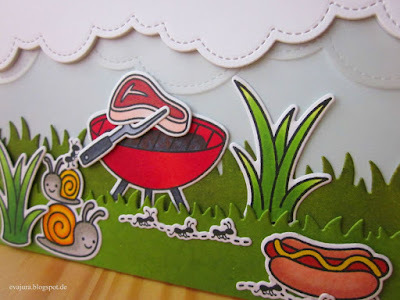 I was inspired to created this card by our BBQ that we had two weeks ago. 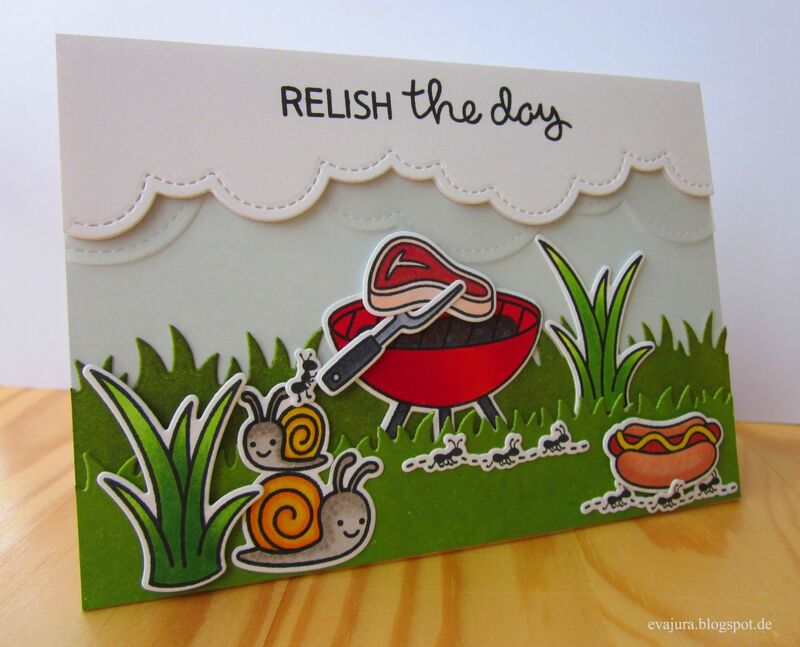 I made the card using a combination of three Lawn Fawn stamp sets, the Let's BBQ, the Gleeful Gardens and the Happy Summer. I colored all of the cute Lawn Fawn images with Copic Markers. 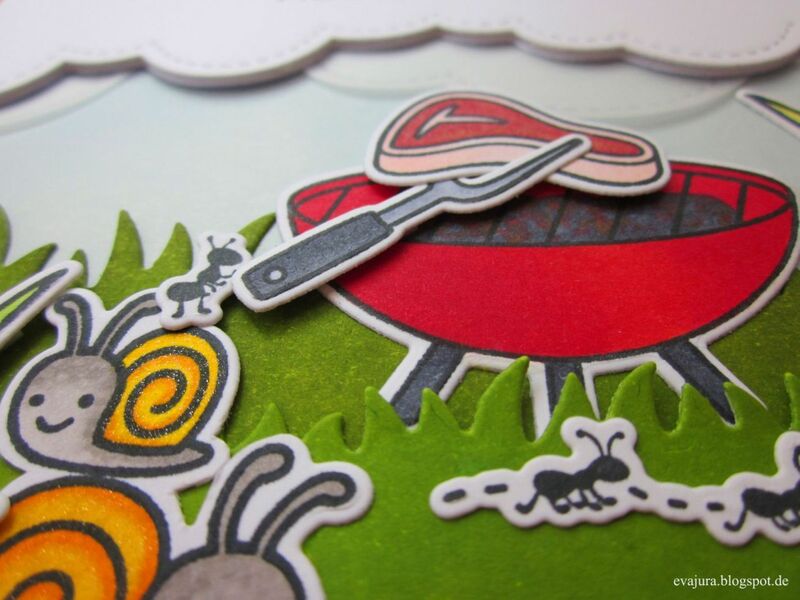 After my coloring was done, I cut out the images using the coordinating dies. I created the gorgeous sky using the Puffy Cloud Border dies, white card stock and some vellum. The background and also the grass that I cut out with the Grassy Fields die-namics by MFT, were colored with my Distress Inks. All of my European followers can buy all of the supplies online at the Stempelküche shop. The lovely Carolin (owner of the Stempelküche shop and also Stempelküche-Challenge blog) celebrated her birthday some days ago. So, I hope, Carolin, you relished your day, lol. It would be nice of you, if you would find same time and go over at her blog, and leave her some love. Thanks for showing your funny Card for paperminutes. Brilliant layering of the adorable images! This card is too cute! 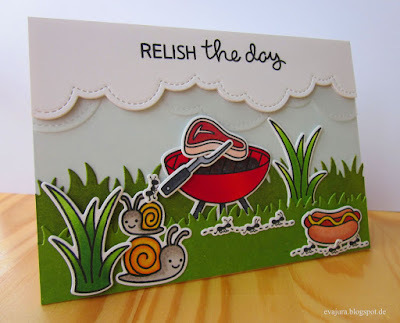 Thanks for playing along with us at Simon Says Stamp Monday "Love this Technique" Challenge!